One of the architects of the Good Friday Agreement has said he is 'sad and angry' at how politics in Northern Ireland sits 20 years after the landmark deal. Former SDLP deputy first minister Seamus Mallon, who helped broker the 1998 peace accord, has accused the Democratic Unionists and Sinn Fein of creating political silos, debasing the process and "almost Balkanising" the country. He said: "Am I sad? Yes. Am I angry? Yes, very angry. Especially when I watch television sitting in my house, just me and the dog, and I watch the hypocrisies which are unbelievable and the untruths which are believable. "Politics has been debased and diminished by these two political silos which have almost Balkanised the Northern Ireland that I live in. "It is the future we should be looking at." Mr Mallon was speaking ahead of a major event marking the 20th anniversary of the agreement at Queen's University in Belfast. Former US president Bill Clinton, ex-British prime minister Tony Blair and former Irish taoiseach Bertie Ahern will be at the conference. The Good Friday Agreement largely ended the 30-year sectarian conflict which claimed more than 3,000 lives. It was codified by the British and Irish governments with the agreement of most of the major Stormont parties, with the notable exception of the Democratic Unionists. He said: "We have to deal with it in a way that causes as little disruption to our political process and it has the capacity to cause considerable disruption. (left to right) Former taoiseach Bertie Ahern, Senator George Mitchell and Jonathan Powell during an event to mark the 20th anniversary of the Good Friday Agreement, at Queen's University in Belfast. "I just trust the politicians of the day, and I am talking principally of the Prime Minister, are capable of negotiating an outcome that resolves some of these issues without some of us having to start putting up flags in order to show how British or how Irish we are in Northern Ireland. I think it is possible to do it." The accord included the early release of around 500 paramilitary prisoners within two years even though IRA arms had not yet been destroyed. Prisoner releases almost torpedoed the agreement in the final frantic hours before it was signed on April 10 1998 - Good Friday. The deal also covered the re-establishment of devolved powersharing at Stormont and establishment of cross-border political bodies with the Republic, and led to a root-and-branch reform of the Royal Ulster Constabulary (RUC) into the Police Service of Northern Ireland (PSNI). Paramilitaries undertook to destroy weapons and the IRA did so in 2005. 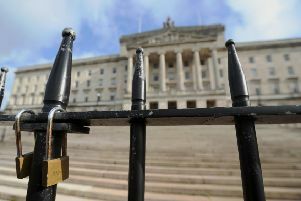 It enshrined the principle of consent - that Northern Ireland's constitutional position as part of the UK would only change if a majority in the region voted for it - while at the same time offering provisions that legitimised nationalist aspirations to strive for a united Ireland. The agreement won the overwhelming support of a majority following referendums in both parts of the island and served as a blueprint for how to solve conflict around the world. Twenty years later a ministerial executive at Stormont has not sat for more than a year in a dispute over the status of the Irish language. The chairman of the 1998 talks, US envoy to Northern Ireland George Mitchell, former Downing Street chief of staff Jonathan Powell, ex-Sinn Fein president Gerry Adams and former Ulster Unionist leader Lord David Trimble will also be present at Queen's University on Tuesday. Later, Mr Clinton and Mr Mitchell will receive the freedom of the city of Belfast in a special ceremony at City Hall. Lord John Alderdice (left) and Peter Robinson during an event to mark the 20th anniversary of the Good Friday Agreement, at Queen's University in Belfast. On Monday Mr Clinton urged compromise and warned that stalemates could continue for only a limited period. Mr Mitchell said peace should not be taken for granted. Mr Blair said the most difficult meetings he had were with the victims as he wrestled with his conscience over the early release of paramilitary prisoners. Mr Clinton said: "No one will drop off the face of the Earth with any of the reasonable compromises that have been discussed. "The only thing that would be calamitous would be to let the whole thing die. To confine ourselves to purgatory or go back to hell instead of going into a future."